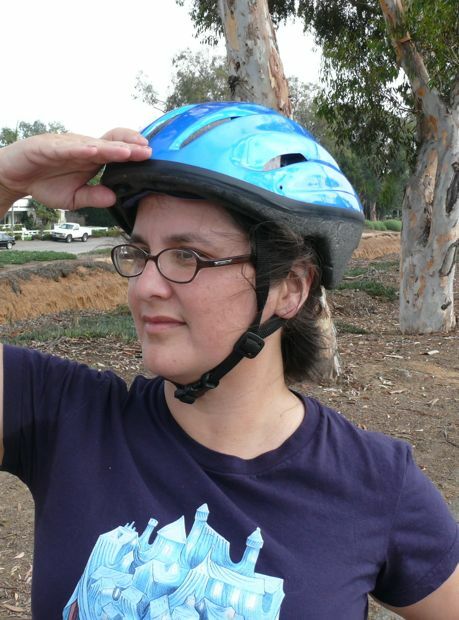 With conviction and confidence, Alex faces the ride ahead. This summer Alex and I got new bicycles. The distance to his school is just slightly too long for walking in a hectic AM, and my mornings are just slightly too hectic getting Max and Maria too their place of higher learning, for giving rides. So we decided to get Alex his own ride, and I offered to join him in a couple of cycling practice runs, to get the route down, and warm up before the new school year. Our family cycling experience over the years has varied from sporadic to non-existent. In a family of six, with a five-year old in the mix, the skills are varied. And more significantly: I do not like traffic, hills, (down or up), and mild agoraphobia may also factor in. Offering to ride with Alex, in my mind, was a flipping big deal. Brave. Daring. Humbling. Sweaty Glistening. Breathless. And you know, really darn brave of me. 1. Traffic: Why are drivers so reckless, distracted, and self-absorbed? 2. Hills-down: Why are hills-down so down, and fast, and woooosh? 3. Hills-up: Why are hills-up, so very much longer than the down ones, and why must they humble me, my thighs, my heart, my sweat glands? 4. The Flat-World: Some people think the world is flat. They may be right. This concerns me. Fortunately Alex has been wiser, braver, and more committed to his new-found transportation. And after getting him set-up and rolling, and feeling really (too) proud of riding around with him a few times, I assumed my job was done: What a good mother I am. Now I can quietly retire from my glorious cycling career. He got me back out there. Oh Lord. Did he ever get me out there. I am not brave and daring, or happily-voluntarily willing to face descending and ascending grades. In traffic I cling to the curb, and prayerfully remind God about my life-worthy qualities. I keep a sharp look out for the edge, for the place where my own two treads have not tread, because if I have not explored that part of the map, I cannot be certain that it is stable, or contiguous. In being the kind of mom that wants to teach by example, there comes a time when the example I set is to surrender, and let the child lead. Alex wanted to ride beyond our street, passed the school, and to the coast, the shops, and beach, the interesting places. And I wanted to avoid this excursion with all of my forty-three years of experience at avoidance, but Alex is good and deserving, fun, and inspiring, and I agreed. I agreed to suppress the voice in my head, the tremble in my knees, and dare to ride beyond my comfort level. Alex has gotten stronger. He is confident. I screamed down one hill, at first out of fear, but then I sort of felt the exhilaration. We only planned as far as the Coast Highway, to a thrift shop we like, but then my confidence increased, and we went a bit further. And further. And when one truck honked at me, and believe me I was no where near his lane, I seriously wanted to re-retire... okay maybe he was honking for some other reason, but why are drivers so reckless, distracted, and self-absorbed?! Gah! In 1983 I rode to school with my mom. Her school, UCSD, when we were living in family housing. I was scared to be in traffic, and I resumed my sidewalk-neighborhood rides, never missing the opportunity to be a sponsored road cyclist. In 1988 I rode with Geoff and his dad, and Marie, in Wisconsin. The traffic was less intimidating, but the bicycle seat and distance we covered felt like they might possibly be fatal. It was a doubly painful pain in my posterior, and I estimated we rode twenty or thirty miles, at least. I was spiritually, emotionally, and physically broken when I learned it was an easy ten mile ride. This marked my second retirement from a glorious cycling career. 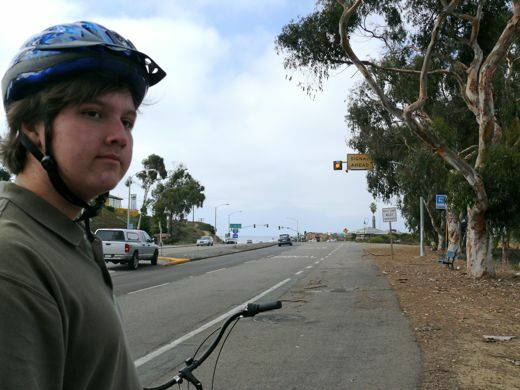 In 2010, led and encouraged by my son, Alex, I rode ten miles, figuring it was probably only five. I was scared, and delighted. I got sweaty, and happy. Alex chose the route, and I followed him down back roads, and to the highway. We road down and up hills, and stopped only once, to browse at a yard sale. We got much further than we had discussed, and jokingly I said "Should we just keep riding until we get to the burger place?" Joking! But you cannot kid a teenager about burgers, and he fixed on this still distant destination like Lance in L'Alpe-D'Huez. Unstoppable! Over burgers, we talked about other routes, other destinations, and how much fun our ride was. We want to go out again. We want to plan a family ride. Alex got me out of retirement. Maybe I showed him it's never too late to try again. I know for sure he's taught me a lot. Yeah Alex!!! Yeah Natalie!!! It is good to push beyond our comfort zones, you never know what new things you will find out about yourself and the world. Another one of the things that happens as a parent no one ever told us about,once in awhile your child will teach you something,make you be daring and brave. Our eldest taught me not to be afraid to talk to strangers.Well, I had to see who was talking to my darling child so he kind of forced me into it by always talking to strangers. High Five to you both. Please invite me next time!! Love, love, love this, Alex (go Alex!) and you! We've been talking about getting bikes here in Portland and I feel that trembling in the knees. But I'm inspired. It's now in our future! Love you! Yay! Awesome! I recently received a bike as a gift and I am completely in love, you described all of my apprehensions of riding around town to the T! But then I took my beach cruiser to the beach and it was a perfect ride. It is finally beginning to cool off and now I cant wait for more rides! Gjo: I could not find higher praise. Thank you. Anna B... next time we go for burgers, of course I'll invite you! dizzy_izzy... woman, you are riding in LA? You are boss! Tracy... sounds wonderful. I look forward to reading about cycling in Norway. Janece... the future is now! Portland bloggers always seem to be posting about gorgeous Portland bike trails. Go for it! Rois... *high five! * We have so much to receive when we turn to our children. Isn't it awesome? Miriam... I understand. I was/am totally fearful of a wipeout. This ride has built my courage, but honestly I am not very much less afraid, and that concerns me. I think my next ride might be harder to face. Burger sounds good...you need fuel after all!